Was June Dishong "Captured" At The Left Edge Of Full-Frame Altgens-6? Re: Was June Dishong "Captured" At The Left Edge Of Full-Frame Altgens-6? Going from memory here and I might be wrong, but I believe that although Dishong herself was not interviewed by, nor did she give a statement to, the FBI, she was mentioned in a FBI statement by at least one of the four gals in the Calvary/Hicks/Reed/Westbrook "party" as being a tangential member thereof. Edit: Turns out I was very, very, very wrong about that. Just now re-read the FBI statements of Calvery, Hicks, Reed, and Westbrook and found no mention of Dishong therein. Don't know how I came up with that silly idea, now. Maybe because I looked for so many years at the Z-frame labeled by Robin Unger (with help from Thierry "Fake News" Speth and Robin "I'll Get It Right Eventually" Roberdeau), and it brainwashed me into thinking Dishong must have been standing next to Karen Westbrook during the motorcade? 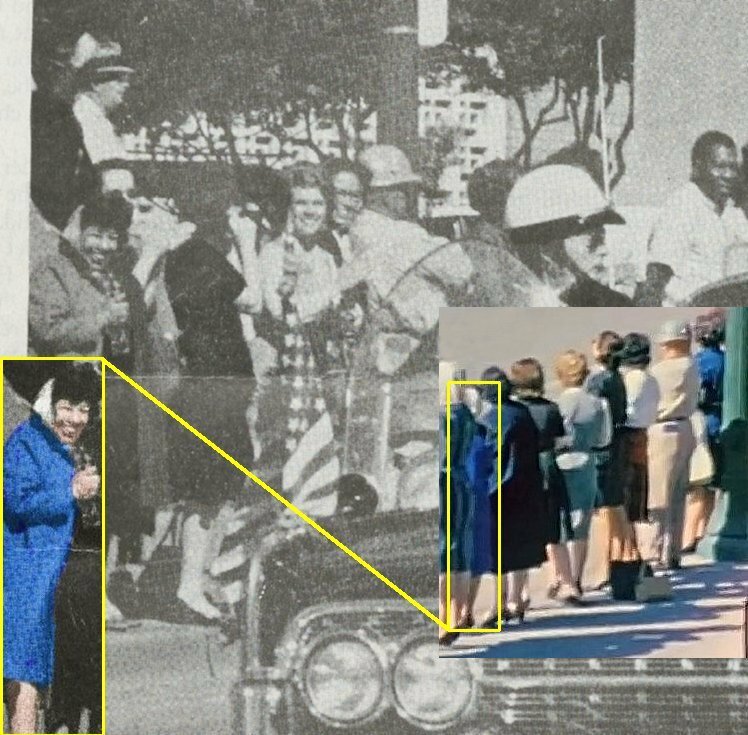 If Dishong's relative (or Dishong, herself) "identified" her/herself from behind in the Zapruder film or a Zapruder frame, one must wonder how accurate they could have possibly been (from behind! ), and whether or not they were encouraged to pick out that particular mystery woman as "June". We already know that Karen Westbrook mis-identified herself in a Zapruder frame in 2017, so apparently it's easy to do. Regardless, it's my understanding that Betzner-3 was published in Life magazine in November, 1967. Edit: Turns out I was very, very, very wrong about that. Just now re-read the FBI statements of Calvery, Hicks, Reed, and Westbrook and found no mention of Dishong therein. Don't know how I came up with that silly idea, now. Maybe because I looked for so many years at the Z-frame labeled by Robin Unger (with help from Thierry "Fake News" Speth and Robin "I'll Get It Right Eventually" Roberdeau, and it brainwashed me into thinking Dishong must have been standing next to Karen Westbrook during the motorcad? We already know that Karen Westbrook mis-identified herself in a Zapruder feame in 2017, so apparently it's easy to do. Thanks for that Thomas, but not a problem. Actually, I was kinda pulling for you in a way.. Keep up the good work! So, where do you believe Dishong was standing during the motorcade? For what it's worth, Dishong's daughter allegedly told Don Roberdeau that her mother worked in the Higgenbotham-Bailey Building (about five blocks from Dealey Plaza in the general direction of the "Old Red" courthouse). It's interesting to note that in her "memoir," Dishong alludes to having watched the motorcade with at least one other person from work. Could it be that she watched it with only one other co-worker, and that that unnamed person was mis-labeled as "Westbrook" in Unger's Z-frame (and in Roberdeau's map) back in the day, i.e., the woman wearing the yellowish-pinkish-orangish dress to the left of (possibly correctly labeled "Dishong") in Unger's infamous Z-frame? Perhaps what you're seeing to the immediate right of "Woman All In White" in Betzner-3 is "My Dishong," not "Westbrook". The version of the cropped Betzner3 Photo that I am looking at has the LadyImage, aka your "Woman All In White", blocked by the high back seat riding SSA whose name escapes me at this time. And, if in color, B3 would likely indicate a light blue head scarf wearing KarenWestbrookImage attired in a white/light blouse and a blue/green jacket or vest with a matching skirt, with/next to NotVeryTallLadyImage, aka BlueCoatLadyImage, who is also wearing a light color head scarf, to Karen WestbrookImage's front-left. That is what I see Tommy, and have seen for some time, and can't imagine any interpretation modification. Based on current indications, if correctly identified, the LadyImage attired in a reddish/grayish blouse and dark skirt standing to StellaJacobsImage's left appears to represent InezJuanitaDishong, who appears to be along side LadyImage attired in a beige/yellowish dress. And, NotTallLadyImage remains not positively identified. At least that would be my indicative information based conclusion. I put her just where she was indicated by Don Roberdeau, A long time ago, in the previous millennium, I was curious to know the ID of the woman to her left. It appears that she was a co-worker of Mrs. Dishong – both working elsewhere than the TSBD. If your hunch is successful that might open the door for someone to sleuth their identities. No big deal. p.s. Okay, so I was kinda “pushing” for you. LOL! Thanks Robin. I had no friggin' idea what Tommy was talking about. A picture is worth a thousand words.